As the temperament of the fundraising market shifts, particularly in the later stages, the question of how much a startup should burn will become increasingly important. We’re living in a historic period of very inexpensive venture capital. These cheap dollars have fueled spectacular companies with record-setting growth rates. In such an environment, growth at almost any cost is handsomely rewarded. But we’re observing the ecosystem starting a correction - particularly in the late stage of the market. And so burn rates will matter more and efficient growth will be prized again. What does that mean for founders when planning their 2016 budgets? After all, everyone building a company wants the business to grow as quickly as possible. But that doesn’t mean spending all the cash reserves in the next sixth months. Here’s a top-down way of thinking about the maximum amount of burn a startup should sustain. It’s a useful exercise when paired with a bottoms-up financial plan starting with leads, sales reps, bookings and cash collections. When determining how much cash your startup can reasonably burn, it’s important to plan for a multiple correction. Today, the early and growth stage SaaS market prices companies on a forward revenue multiple. This is a public market investment term meaning the value of the company is equal to some number multiplied by the sum of the next twelve months of revenue. The top quartile public SaaS companies trade at about 7.5x forward revenues. The top 3 - Xero, ServiceNow, Workday trade at about 10.5x forward. The best companies in the private markets fetch roughly 15x forward, or twice the public top quartile. Multiple is a function of many things including growth rate, market attractiveness, team qualification, margins and other considerations. The first case in blue shows the company raising at 15x forward revenues at Series A and Series B. The case in green shows the impact to valuation if a halving of the forward multiple to 8x were to occur in between the Series A and Series B. In the blue case, the valuation of the business balloons from $30M to $75M. The company likely raises about $15-20M in the Series B, and everything is roses. In the green case, the valuation of the business increases modestly from $30M to $40M. The company likely raises $10M, which means that the value of the business, net of the new cash, hasn’t change despite a 250% growth in revenue. This is certainly not the outcome the founders might have expected. The goal of this exercise is to determine exactly how far into the future the business must be in order to raise money at an increased valuation relative to the last round if multiples halve - and whether or not the company currently has enough cash to finance its operations through to that period plus enough time for fundraising. If the cash position of the company isn’t strong enough, it’s time to cut burn and/or raise more money. Now, let me say a few things about this framework. First, I can’t say when or if this multiple correction will ever happen. Second, I can’t promise that if multiples were to fall, they would be at 8x forward - they might be higher or lower. 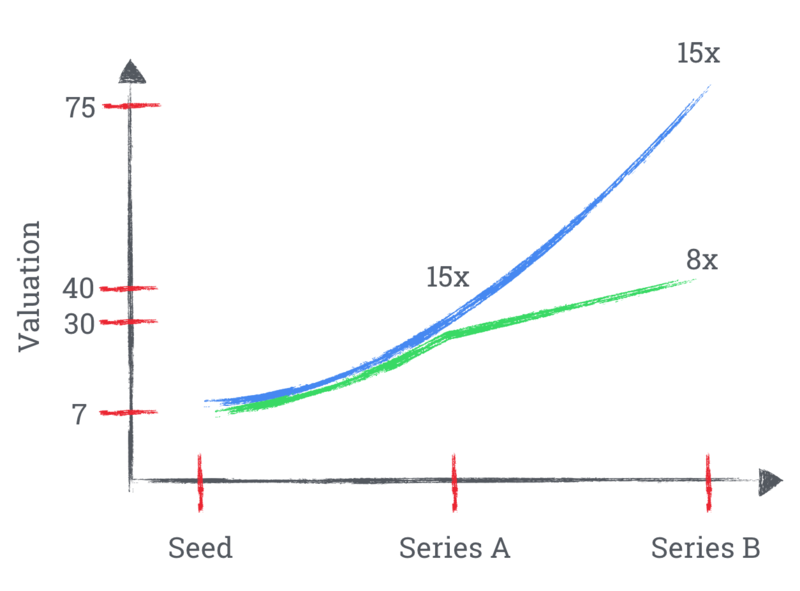 Third, forward multiples are much more common in the Series B and later rounds, and less common in Series A and Seed so earlier stage companies may not have been priced this way in the past, but they will be as they progress. Now, let’s transition from the theory to the observed data. 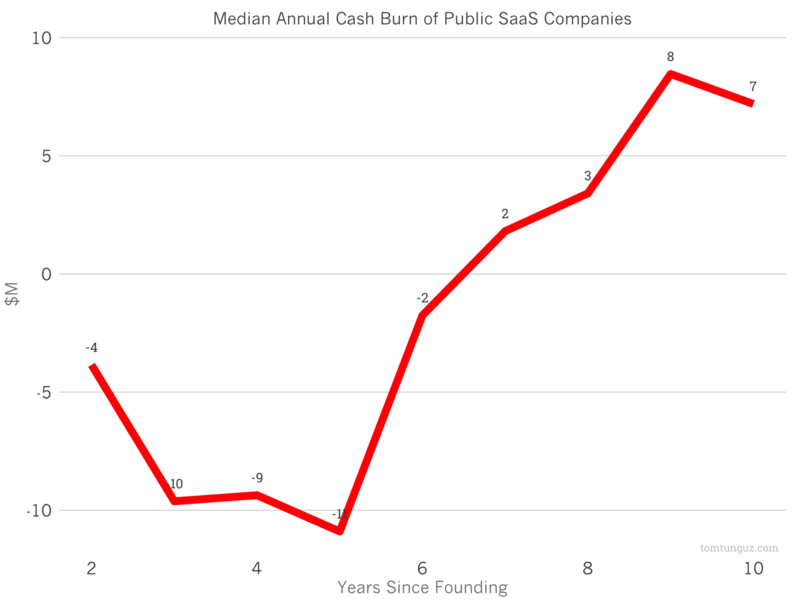 The chart above shows the median burn rate of publicly traded SaaS companies by year. It’s called cash from operations on their financial statements. By year two, the companies are burning about $4M per year, which ramps to $10M from years 3-5 and then decreases as the company scales revenue to about break even. There’s a huge variance in the data, but I think the median is an accurate representation of what I’ve seen in the market today. When determining how much cash your startup should spend, perform a bottom-up financial plan and a top-down analysis like the one above to ensure your startup is always in a position to raise capital at a more attractive valuation than the previous round.